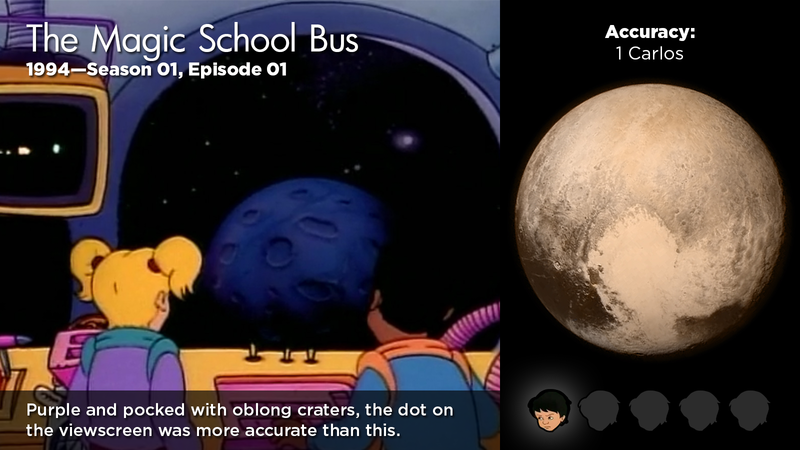 It pains me to say it, but the worst depiction of Pluto (at least on TV) was possibly the one in the very first episode of The Magic School Bus. 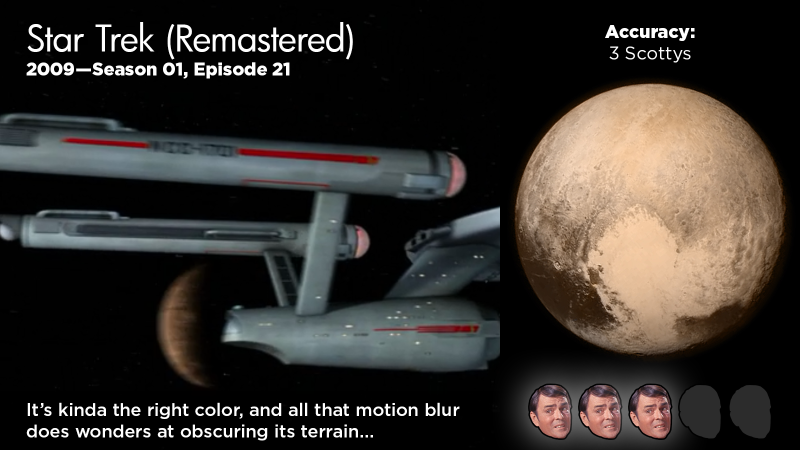 It’s terrible: purple, weirdly-shaped (plus weirdly-shaped craters on a planet that turned out to have none), and of course Arnold takes his helmet off on the dwarf planet’s surface and doesn’t die, because Pluto is warm and has a dense, breathable atmosphere. It was a great series, and this episode is one of the better-known ones, but Frizzle’s Pluto rates dead last, earning just one Carlos. 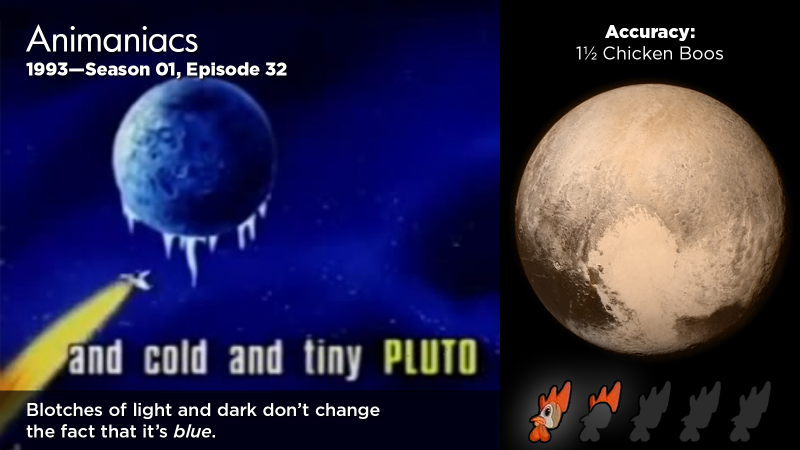 Much more forgivably, the Animaniacs’ Pluto (from the Solar System song) wasn’t much better than Miss Frizzle’s. Blue-purple may have been popular because it feels dark and cold, and Pluto was also dark and cold. The patches of lighter and darker surface coloration take it slightly ahead of the School Bus, and earn this Pluto one-point-five Chicken Boos. Even though it’s better than purple-Pluto, I’m a little disappointed in Bill Nye’s take on the (then) planet. I’m not dinging him for the Real World-inspired intro (that’s clearly a joke) . 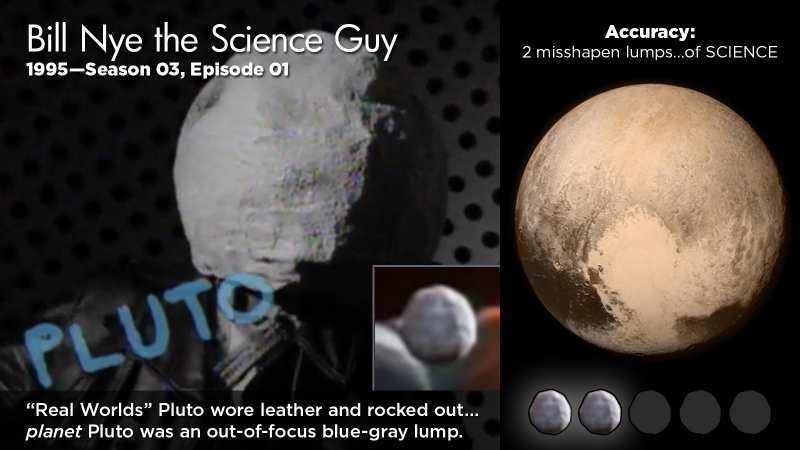 . . but for the rest of the episode they kept their model Plutos as very small blue-grey blobs. Neutral color, always out-of-focus . . . it’s hard to be wrong when you’re deliberately side-stepping it, but it’s hard to be right, too. Even though it was probably a deliberate choice (to avoid overstating how much we knew about Pluto) I still give the Bill Nye Pluto a paltry two misshapen lumps . . . of SCIENCE. When Dr. Neil deGrasse Tyson decided not to include Pluto in the Hayden Planetarium’s solar system exhibit, he may have received more letters from furious third graders than anyone else before or since. “The Pluto Files” was his televised attempt to convince those third graders not to murder him. 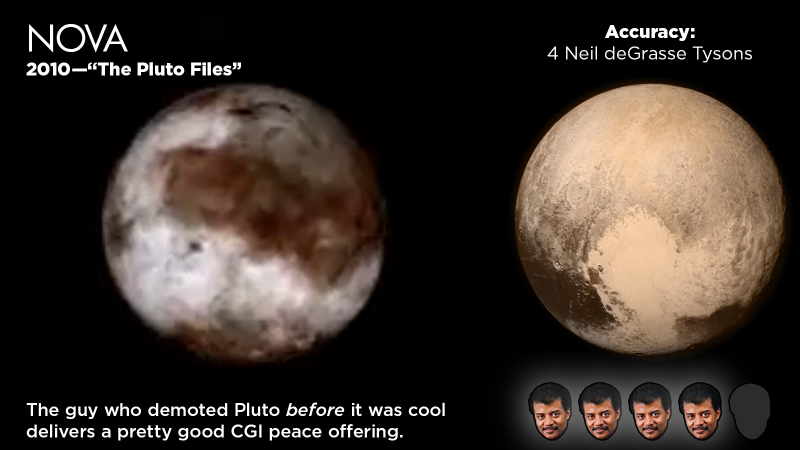 (Briefly) featuring a CGI Pluto (specifically, to show that Pluto is tiny next to even Mercury and therefore undeserving of “planet” status), Dr. Tyson’s Pluto isn’t quite the right color, but its dark reasons are pretty close, and the surface has good light/dark contrasts. All in all, a good effort worthy of four Neil deGrasse Tysons. In 1991, the U.S. Postal Service created a stamp series dedicated to exploring our space-neighborhood. 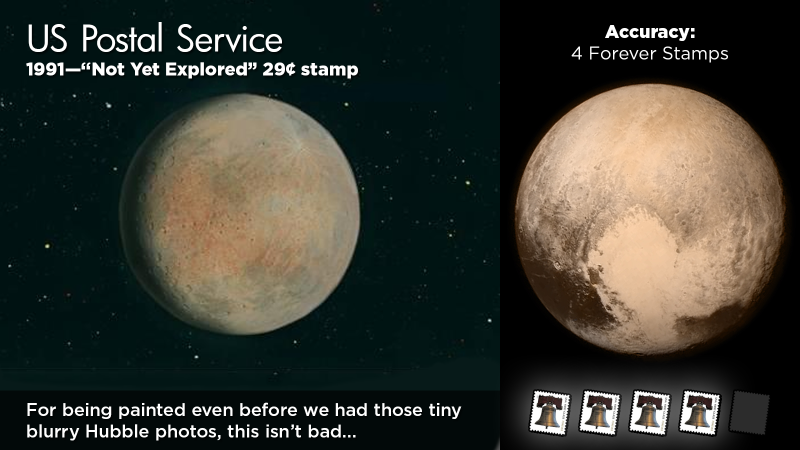 Stamps were issued commemorating our missions to every single planet save one: Pluto, which got a “not yet explored” where every other stamp had a satellite or probe. Painted by Ron Miller of Virginia (holy heck, and who writes for io9! I missed the connection, so thanks, Dr. Lizardo!) 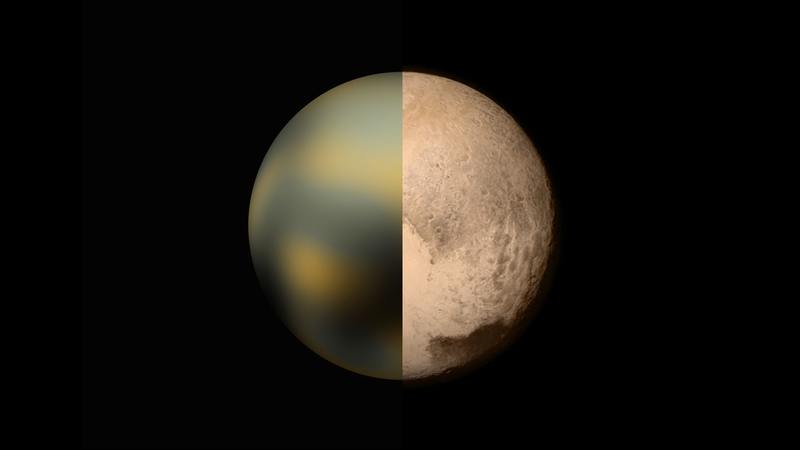 the Pluto stamp features a tan-orange sphere pocked with a smattering of craters. While the real Pluto has more variation and fewer impact scars, this was painted in an era before even the blurriest color Hubble photos, making its “in the ballpark” hue just a little more impressive. And it looks nice! Four “Forever” stamps. 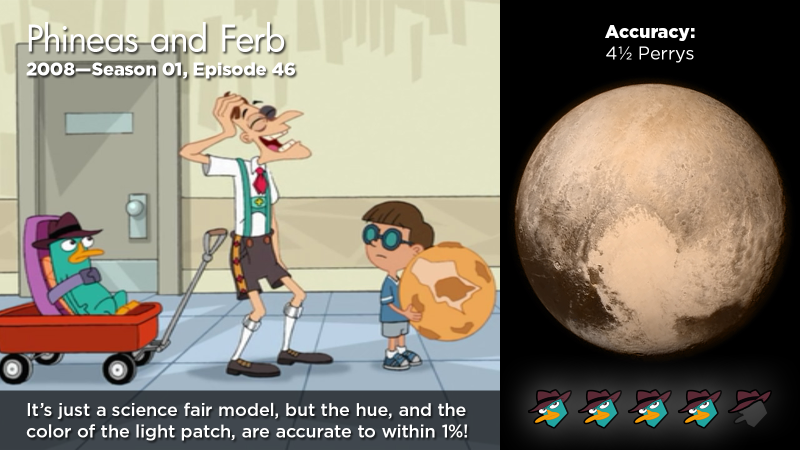 Yeah, it’s a little saturated, but the hue of Phineas and Ferb’s Pluto is dead on. And look at that big pale blotch, which is exactly the same color as the big pale blotch on real Pluto. Add the regions of varying darkness, varied surface topology, complete lack of craters, and the fact that it’s a papier-mâché elementary school science fair model serving as a one-off joke in a children’s cartoon about a crime-fighting platypus, and you can perhaps see why the Phineas and Ferb Pluto gets four-point-five Perrys. An earlier version of this post awarded slightly different scores. Previous PostPrevious How Much Money Would It Take To Fill Scrooge’s Money Bin?